In about 1940 Charles (C.J.) 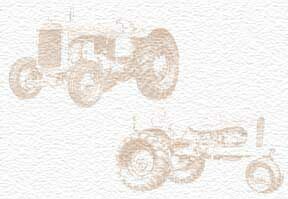 Dukehart and Bob Hughes formed an A-C "earthmoving equipment" dealership for Iowa. For most of its existence it was the "Dukehart-Hughes Company" of Des Moines, with a branch for a while in Cedar Rapids. For the last few years of its life it was owned by a Mr. Graham and was known as "Graham Equipment Company." My father, Harold Sumption, was working for the Allis-Chalmers farm equipment wholesaler in Des Moines when Messrs. Dukehart and Hughes asked him to join them in their new construction equipment dealership. He worked with them for the rest of his career, first as Parts and Service Manager, then as it grew, just Parts Manager. I was born in November 1941, just as Dukehart-Hughes was getting established. My Dad and his colleagues were exempted from service in WWII as heavy-construction equipment maintenance was deemed essential to homeland defense. My childhood was spent scrambling over gigantic machinery when Dad would go to "the shop" anytime 24/7 to pull and ship parts (by Greyhound Bus)to idled contractors. Allis-Chalmers permeated my life from birth through my Dad's death--from the A-C calendars always on our walls to the miniature A-C dozer magnets on the car's dashboard to the A-C orange tape wrapping every box I got from home while moving around the country. I have vivid memories of touring the West Allis manufacturing plant and of driving the A-C tractors on my uncles' farms (no John Deeres there!). I would love to hear from anyone who had any association with Dukehart-Hughes or A-C heavy equipment in Iowa.